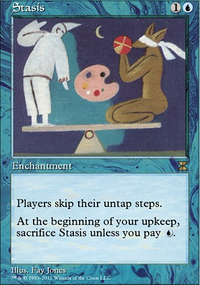 Daxos of Meletis stealing Birthing Pod in EDH, is it usable? 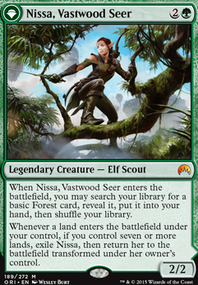 , , Sacrifice a creature: Search your library for a creature card with converted mana cost equal to 1 plus the sacrificed creature's converted mana cost, put it onto the battlefield, then shuffle your library. Activate this ability only any time you could cast a sorcery. abbaen Honestly I think all of those are great additions!! 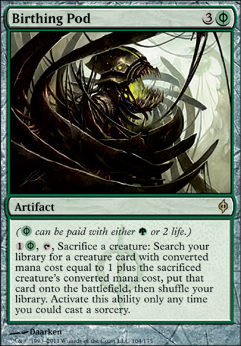 If you run Vannifar, Birthing Pod might also be worth it too for recursion. 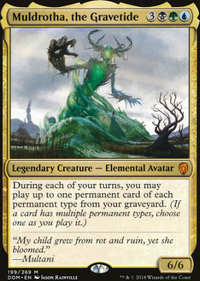 I am-“ currently thinking of running protean hulk in my deck and being able to recast it is amazing. Pattern of rebirth is an all around great card and I could see it being a good addition too! You may want to consider Mystic Remora as you can keep letting die and bring it back for only one blue. My friend has a copy of Birthing Pod in his and it has been extremely effective at getting many powerful creatures out quickly. I think it has a lot of the things that you are trying to do, minus some synergies. My deck tries to grind more value from the creatures and eventually win through a fantastic win with Jarad, Golgari Lich Lord sacrificing Lord of Extinction after fueling the graveyard with Hermit Druid (the deck plays lots of basics, so it isn't as bad as it looks to the opponents) and Underrealm Lich . Cut the cluestones and add the signets in their place. The difference between ramping on 3 to 5 is less important than from 2 to 4. 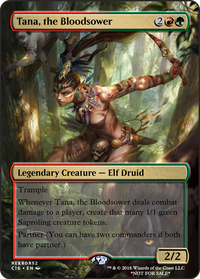 Please add Swords to Plowshares and perhaps Path to Exile to your deck. 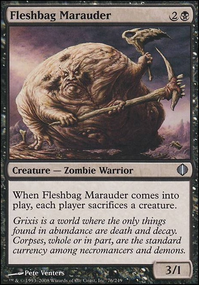 Swords is the best creature removal and is a dollar. You can have inexpensive reanimation spells like Death , Animate Dead and Victimize to reclaim lost friends. Pattern of Rebirth This was reprinted in UMA and is a couple dollars. If you can kill your stuff, it fetches anything at instant speed. 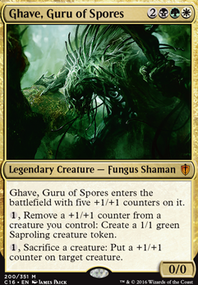 Birthing Pod Pod is so much value and it makes you consider your creature curve. It helps lower it a bit to give your more diverse choices on the lower end. 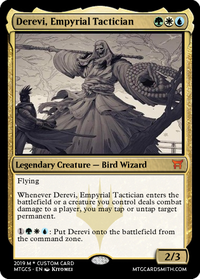 Pod also just so happens to kill your commander (who is usually cast for 3 mana) to fetch a Void Winnower to make opponents sad. Eldritch Evolution I am unsure if I saw this card in the deck, but this card is a baby pod that can get ANY card with x+2 mana of the card you sacrificed. You can turn a 5 drop into a better 4, or even a 7. Whatever is needed. Amazing value.